Pyrex advertising during the Christmas season focused on two groups: consumers (the obvious choice), and store buyers (less obvious, but certainly just as vital). Marketing to store buyers was important for Corning Glass Works because these business people were the ones responsible for closing the final sale with shoppers. 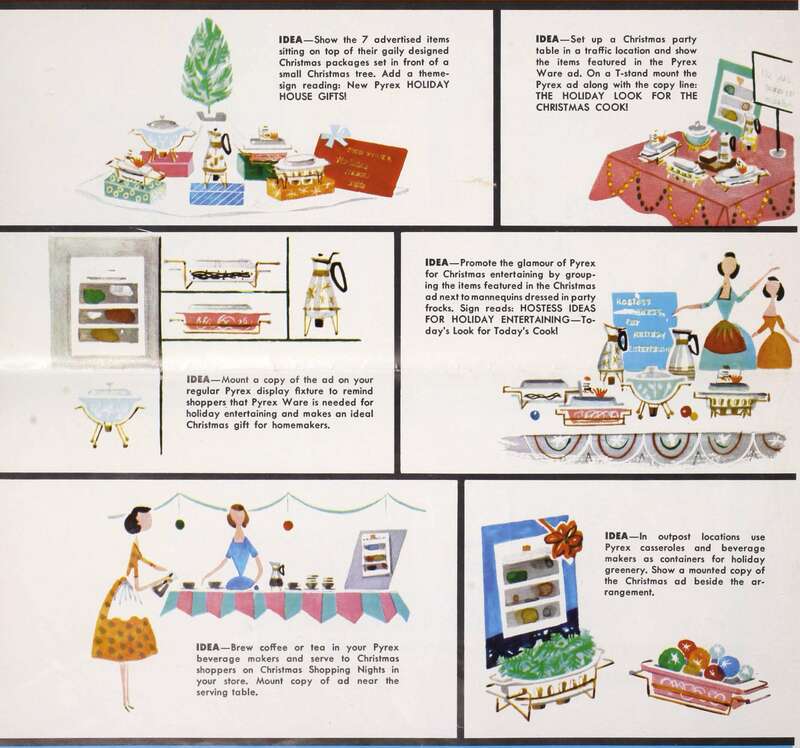 Corning Glass Works offered promotions like counter cards and display kits to make stores into “Gift Headquarters.” They also periodically sent out inserts called “The Pyrex Sales Maker” in publications read by store buyers such as Home Furnishings Daily. These mini-publications offered display set-up ideas to increase sales. 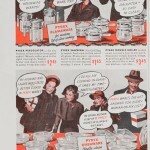 Detail from page 1 of “Pyrex Ware Sales Maker: ideas for Christmas 1958.” Insert from Corning Glass Works published in Home Furnishings Daily, September 29, 1958. CMGL 144559. Show the 7 advertised items sitting on top of their gaily designed Christmas packages set in front of a small Christmas tree. 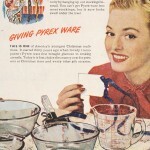 Add a theme-sign reading: New Pyrex HOLIDAY HOUSE GIFTS! Set up a Christmas party table in a traffic location and show the items featured in the Pyrex Ware ad. 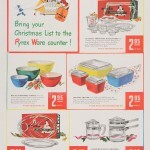 On a T-stand mount the Pyrex ad along with the copy line: THE HOLIDAY LOOK FOR THE CHRISTMAS COOK! Mount a copy of the ad on your regular Pyrex display fixture to remind shoppers that Pyrex Ware is needed for holiday entertaining and makes an ideal Christmas gift for homemakers. Promote the glamour of Pyrex for Christmas entertaining by grouping the items featured in the Christmas ad next to mannequins dressed in party frocks. Sign reads: HOstess ideas for holiday entertaining — Today’s Look for Today’s Cook! Brew coffee or tea in your Pyrex beverage makers and serve to Christmas shoppers on Christmas Shopping Nights in your store. Mount copy of ad near the serving table. In outpost locations use Pyrex casseroles and beverage makers as containers for holiday greenery. Show a mounted copy of the Christmas ad beside the arrangement. 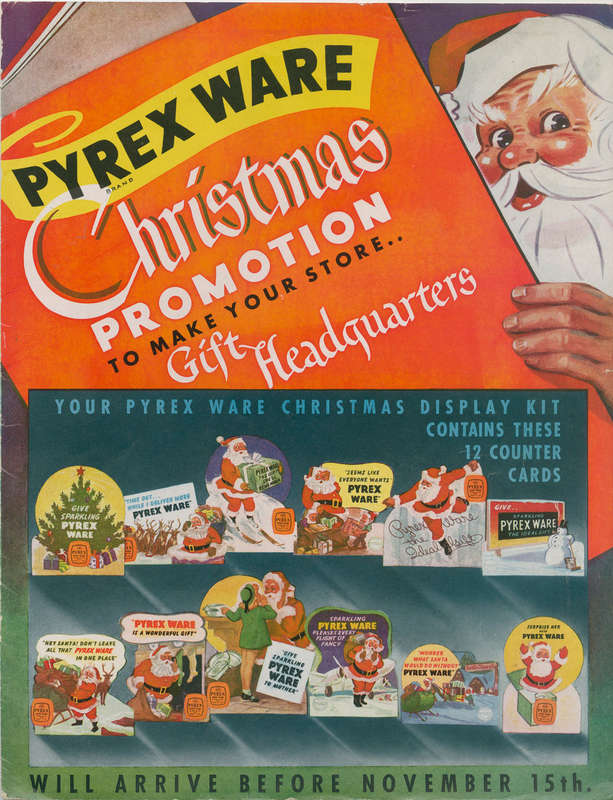 “Pyrex ware Christmas promotion: to make your store… gift headquarters.” Promotional booklet published by Corning Glass Works, 1944. Digital image was gift of World Kitchen LLC. CMGL 142569. 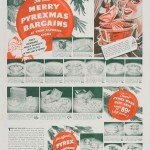 The next step was getting shoppers into the stores to see these festive displays of Pyrex, which meant another entirely different advertising campaign directed at consumers. The perfect hostess looking to set a glamorous and inviting table or any shopper in search of that ideal gift to make every homemaker on his or her list fit the bill, but of course the ideal consumer fit into both categories. 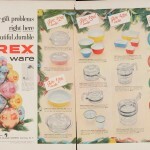 These colorful ads may have disappeared from magazines, but our holidays certainly do not lack a touch of Pyrex. Many of us still make meals in our heirloom or second-hand shop Pyrex and we don’t need catchy slogans to tell us that Pyrex should be a staple in our homes—we already love it, collect it, and relish the chance to share it. 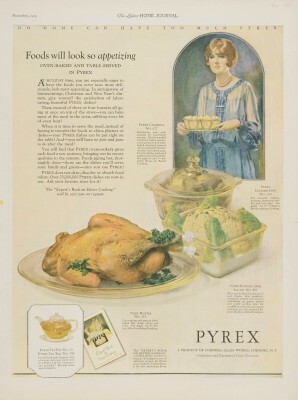 But Pyrex might not evoke in us those strong feelings had it not been for the advertising campaigns of yesteryears prompting our parents and grandparents to bring these lovely and useful dishes into their homes, and, thanks to their durability, to pass them on to us. Wishing all of our readers and fellow-Pyrex lovers a very happy holiday season!